Over the next few weeks, we’ll unpack each of these aspects of caring and will continue this week with confrontation. 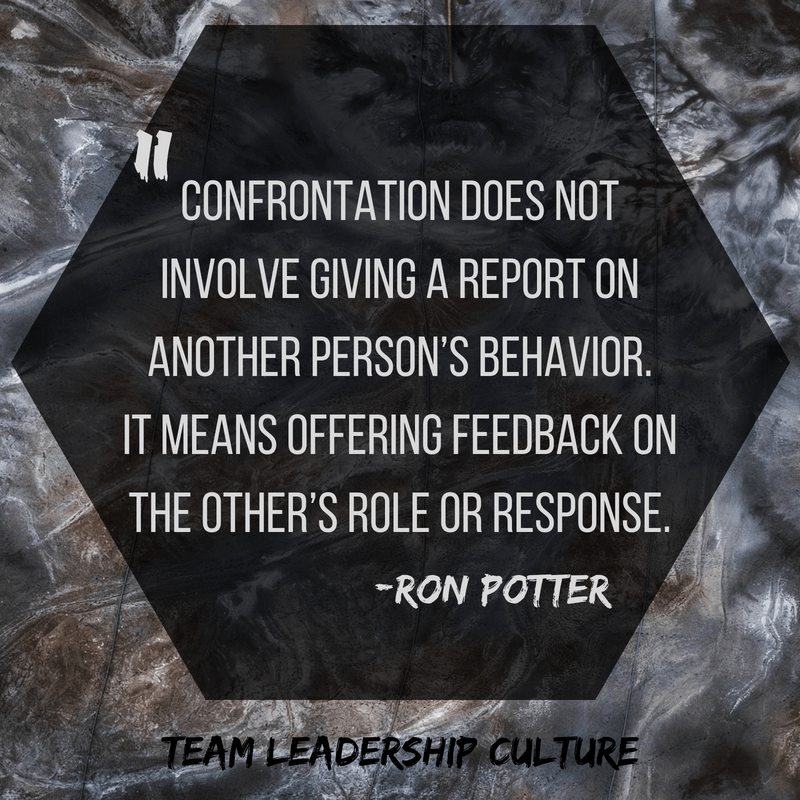 Confrontation does not involve giving a report on another person’s behavior. It means offering feedback on the other’s role or response. Its goal, in the business environment, is to bring the employee, boss, or peer face to face with issues (behavior, emotions, achievement) that are being avoided. You cannot confront someone on hearsay alone. Get the facts. Investigate the matter; check it out. There are always two sides to every story. What are they? Neither one is likely to be the “complete” truth. Look for the balanced story. I once witnessed a near catastrophe. A client of ours was going to confront a customer. The customer had called the day before and verbally leveled several people on our friend’s staff. My client was going to call the customer and confront him with some brutal truth: “Everyone in the office is afraid of you and doesn’t want to talk to you because of your aggressive style and attitude.” Just before our client was to make the call, someone in the office discovered that the customer’s wife had colon cancer and possibly multiple sclerosis. The customer was suffering right along with his wife, in addition to trying to be both Dad and Mom to the kids, coaching a sports team, and running a tough business. Instead of calling to confront the customer with the brutal facts, our client decided to confront him with care and sympathy. Many situations will not be this clear-cut. The right timing may be harder to gauge. For sure, though, it is best to deal with a situation when the heat of the moment has passed. Having the courage and taking the time to come back to it after emotions have subsided is actually quite difficult. There never seems to be the same urgency later, but good leaders force themselves to pick up the issue at a better moment. When it is the right time to confront, the green lights will be flashing. Until then, hold on. I suggest that you carefully plan what you will say when you confront someone. A proverb says, “Timely advice is as lovely as golden apples in a silver basket. Valid criticism is as treasured by the one who heeds it as jewelry made from finest gold.” Words have the power to destroy or heal. Choose them carefully when confronting. Don’t fall back in fear when you need to confront someone. If you have assembled the truth, believe it is the right moment, and have carefully prepared what you will say, move forward and confront. As Roger Clemens did with Curt Schilling, press on: “How can I help this person be better, regardless of how I feel?” It may mean finding a more productive or satisfying place for the person—even if it’s with another company. In the end this option is better for the organization and, in most cases, for the other person. What is worse is allowing a person to continue in a harmful behavior or self-destructive attitude. Next week we’ll continue our discussion by unpacking caring through challenge.